The Legal Nurse Consultant Certification specialization enables nurses to function in a legal capacity performing chart reviews and working in quality assurance for health care organizations. The nurse with the Legal Nurse Consultant Certification is frequently employed to engage in medical-legal activities. Prepare with our LNCC Exam Study Guide and Practice Questions. Print or eBook. Guaranteed to raise your score. Get started today! In order to take the Legal Nurse Consultant Certification exam, the applicant must be a licensed Registered Nurse. The RN must have been employed for at least 5 years with at least 2,000 hours of experience functioning as a legal nurse consultant within the past 3 years. The Legal Nurse Consultant Certification exam is offered at 47 testing sites throughout the United States. It is offered twice a year, in the Spring and Fall. The fee to take the exam is $275 for American Legal Nurse Consultant Certification Board members and $375 for non-members. LNCC Test Flashcards. 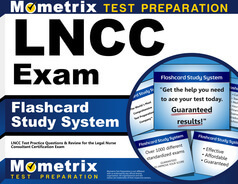 Proven flashcards raise test scores on the LNCC test. Guaranteed. 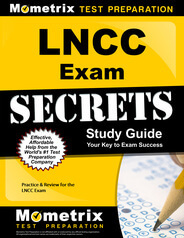 The exam consists of 200 multiple-choice questions and 4 hours are allotted to take the exam. The questions on the exam pertain to issues related to gathering and analyzing legal data, specific legal issues and legal mandates, and specific information regarding the legal process. There are also questions pertaining to specific fields of law, such as medical malpractice or negligence, personal injury, and risk management. Legal Nurse Consultant Certification is valid for 5 years. At the end of that time period, the licensed RN will have been employed as a legal nurse consultant for at least 2,000 hours within the past 5 years. In addition, at least 60 continuing education hours pertaining to Legal Nurse Consulting should have been completed. If the continuing education hours are not completed, the exam can be retaken to complete the re-certification process.